You're Invited! 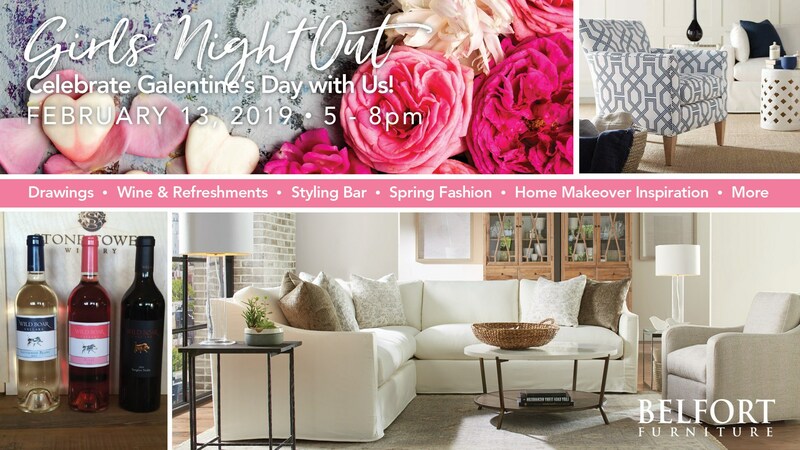 Celebrate Galentine's Day with us as we host February's Girls Night Out Meet Up Networking Social at Belfort Furniture on Wednesday, February 13th from 5-8pm. This is an exclusive opportunity to see the makeover of our huge new showroom and discover our new in-house Wine Bar featuring Stone Tower Wines! *Complimentary Stone Tower Wine and light bites. We'll be giving away a $250 Belfort Furniture gift card and a private tasting and tour for 4 at Stone Tower Winery. Come early! The first 50 guests will receive swag bags featuring complimentary tastings at Stone Tower Winery.